Pickled onions are prepared in several ways in Mexico. For example, in the Yucatan area, it is made with pickled white onions and habanero or Xcatic peppers. Garlic and other herbs and spices can also be added. There are other recipes that are easier and quicker, where you just slice or chop the onion and add salt and lemon to macerate. In Mexico, the states of Zacatecas, Chihuahua, Tamaulipas, Guanajuato, Baja California and Michoacán are the main producers of onion. White onion comprises 85-90% of the harvest, while red and yellow onions average 7% and 3%, respectively. Growing up, I didn’t see that much red onion at home, since red onions are more common in the cuisine of the southern states. It was until I went to live in the south back in 1980 that red onions became a part of my everyday cooking. Red onions are a staple in the cuisines of the State of Yucatan and other states in the Yucatan peninsula. In these states, it is common to served pickled onions (pickled with vinegar, bitter orange, or lemon) at the table when eating stews or other traditional dishes from that region. Yes, we Mexicans like onions a lot, so much that the average person in Mexico consumes about 12 pounds of onions each year. We eat them in salsas, stews, pickles, and soups, either raw, cooked, grilled… well, you get the idea. 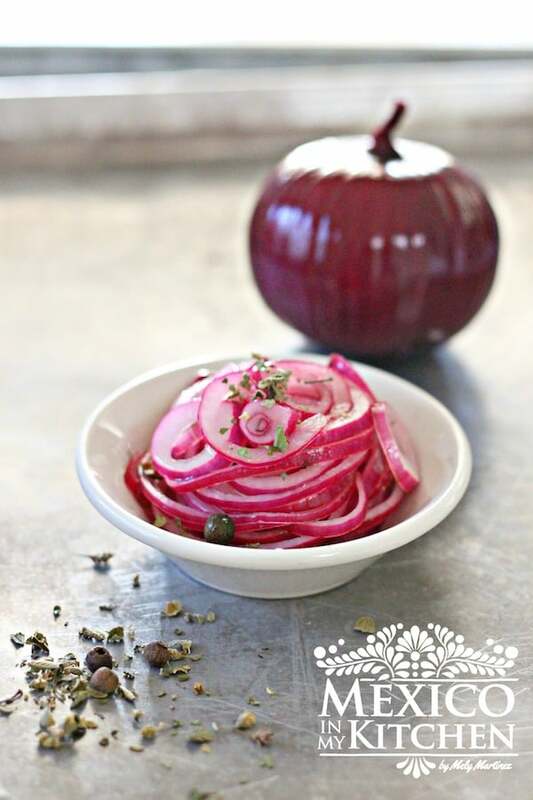 What follows is my own quick and simple recipe for making pickled onions, or in Spanish: “cebollas curtidas”. Peel onions and thinly slice them. Place 4-5 cups of water in a saucepan and bring to a boil. When water starts bubbling, add sliced onions, and turn the heat off. After 2 minutes, quickly drain the onions into a colander over the sink. 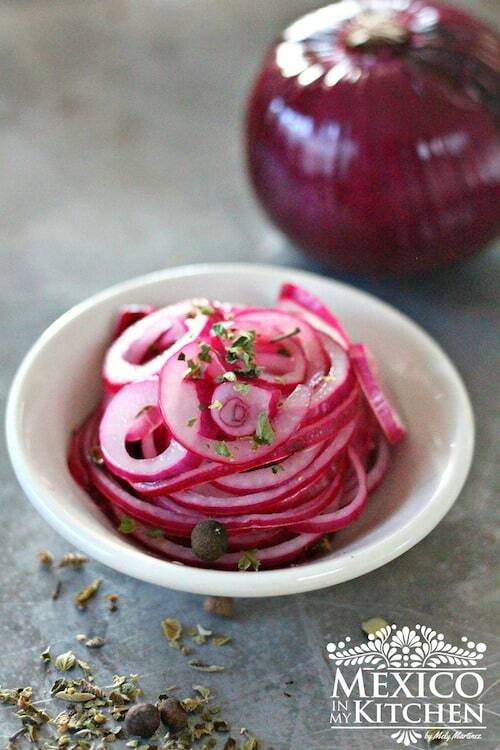 Place the drained onions in a glass bowl and add the vinegar, water, oregano, bay leaf and the rest of the spices. Season with salt and mix well. Refrigerate for a couple of hours, and they are ready to eat. Enjoy with your tacos, tostadas, subs, sandwiches or grilled meats. Pickled onions are prepared in several ways in Mexico. For example, in the Yucatan area, it is made with pickled white onions and habanero or Xcatic peppers. Garlic and other herbs and spices can also be added. There are other recipes that are easier and quicker. Toast Mexican oregano in a small skillet over medium-high heat for about 30 seconds. Set aside to cool. Place the drained onions in a glass bowl and add the vinegar, water, oregano, bay leaf and the rest of the spices. Season with salt and mix well. Refrigerate for a couple of hours, and they are ready to eat. They keep well refrigerated for about a week. And they taste best when prepared at least one day in advance. This recipe tastes better using a combination of 2 parts lime juice, 1 part orange juice and 1 part grapefruit juice instead of the vinegar. Since the original recipe is make using Seville bitter orange juice and it is hard to find outside of Mexico, and even in some states in Mexico, many cooks use vinegar as a substitute. You can also find this recipe in Spanish: Cebollas Moradas Curtidas. Previous Post: « Are any of these 6 Mexican cooking utensils in your kitchen ? 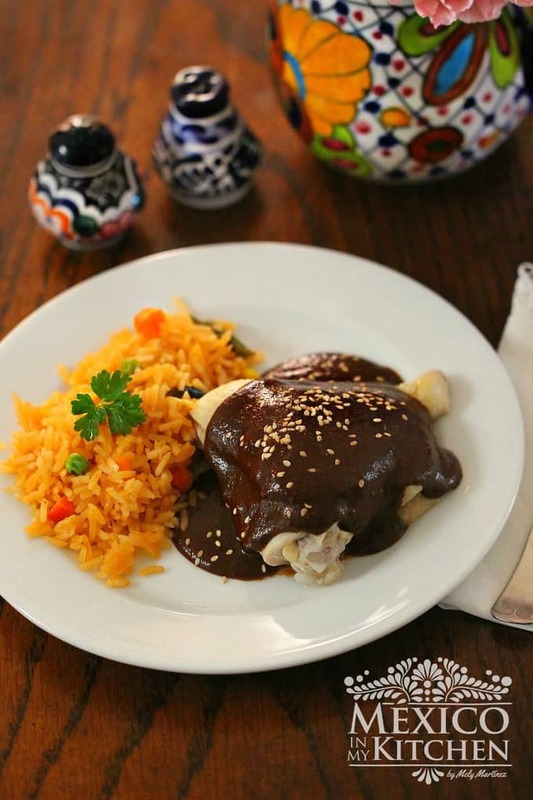 I came to your blog for the red onion recipe but will really like to have the recipe to the enchiladas and gravy if you would share or point it to me on the blog. I was wondering if these pickled onions are ever made by straight fermentation – submerging them in brine for a few days. I'd always made Salvadoran curtido with vinegar, but after I started making sauerkraut, I thought, hey, I could just make sauerkraut with carrot, onion, oregano & chili, & that would be like curtido, right? Turns out that's the original way it was made. Anyway, I'm making cochinita pibil for the first time, & I've made a small batch of pickled onions with vinegar, and set another to ferment in brine. We'll see how they turn out. Yes, you can use the same method as the pickled cabbage-curtido from el Salvador. There is Naranja agria sold in a bottle, widely available here in stores. I have used this with great success. It most definitely NOT fresh bitter orange juice, and does contain some grapefruit, orange essence, and orange oil. ¡Hola, Meli! ¿Se pueden guardar estas cebollas? ¿Por cuánto tiempo? Gracias. Saludos desde Mar del Plata, Argentina. Estas cebollas se conservan hasta dos semanas muy bien en el refrigerador. Saludso!